1) White Porcelain Urns from Williams-Sonoma Home. The neo-classical shape in a crisp and glossy white would look great as a vase and in a group of three down the middle of the table. 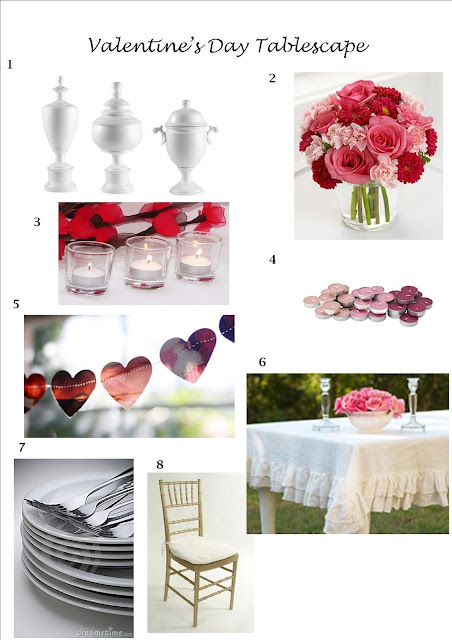 2) FTD Precious Heart Bouquet. Cluster these types of flowers (radiant hot pink roses, deep red matsumoto asters and light pink mini carnations) in the urns. You could also use three white vases. 3) Clear shot glasses can be used to hold tea lights. These are from here. 4) Rose scented tea lights. You can purchase these at any candle store. 5) Heart Garland strung above table. 6) Pretty white linen Table Cloth with ruffles. 7) Classic white plates with silverware. 8) Chivari Ballroom chairs in gold. You can use chairs you already own and tie pink ribbon around the backs to dress them up a little bit. Hope you're excited about the romantic day tomorrow and that you have some super romantic plans with your significant other.